Simple space shooter; arcade style ad fun! 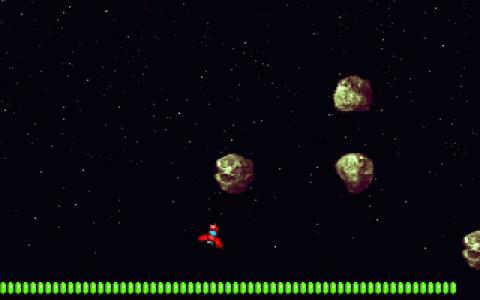 Blastocyst is a definitive remix of Asteroids, but with enough novel ideas not to be a complete rip off. So, here's the gist of it: you control a space ship, in a top down environment. You can choose to change direction by properly aligning your thrusters to the opposite direction of where you want to go. Then, you have a meter, expressed as a bar at the bottom of the screen, which depletes as you speed around; it's like your fuel gauge. This bar gets recharged as you destroy the asteroids. So, you have to always be in the action, you can't just dodge the asteroids ad infinitum. If you do that, you'll soon end up with no more fuel. Also, you want to be very careful about the manner in which you control your ship; except for the regular movement you, also have a spinning special move, which, allows you to spray shoot all the asteroids in your vicinity at high speeds. As you'd imagine, this will consume a whole load of materials. So, all in all, Blastocystis the kind of game that will truly satisfy those that love classic shooting in space. Asteroids is what inspired it, but graphically its lots more developed, so, you'll definitely find it pleasing to look upon.